Where’s the Double Dragon when you need them? Continued from last issue. As Iron Man battles Fin Fang Foom around Seattle and Happy helps with rescue operations, nobody except Fin knows about the kid in his head whose body he appropriated. Billy fights to keep his mind going and resists Fin so the dragon tries to force him to fight and spend his mental energy by threatening his hospitalized sister. This backfires as Billy fights harder and leaves the body open for Iron Man’s last strike. This costs him the rest of his self, a sacrifice only his enemy is aware of. What they got right: I like this story of a lone human mind fighting and winning against Fin Fang Foom. While kind of tragic it’s also a victory and just great to read. We also see Happy is still doubting himself but when it’s called for he springs into action. 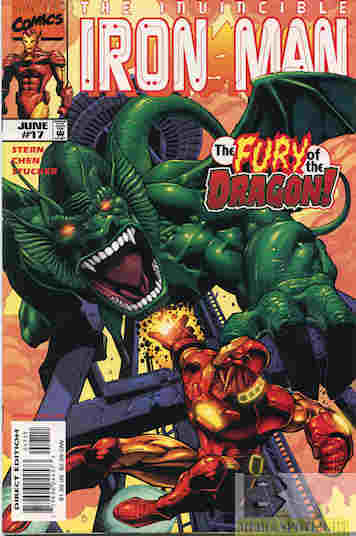 And the art team does a great job on showing the size and power of Fin Fang Foom as he battles Iron Man. What they got wrong: Please tell me they aren’t trying to set up a Tony/Pepper romance. I want her back with Happy…at least until they kill him off years later and give us Tony/Pepper anyway for a short time, and I’m not happy (no pun intended) about that. I also don’t want a Tony/Pepper/Happy triangle. Recommendation: A good two-part story worth checking out. Posted by ShadowWing Tronix on November 6, 2018 in Marvel Spotlight, Yesterday's Comics and tagged Fin Fang Foom, Happy Hogan, Iron Man, Marvel Comics, Marvel Universe, Pepper Potts.